The early 1900’s were the heyday of decadent layer cakes with wonderful fillings, so when I recently needed to make a birthday cake, I immediately knew that I wanted to make a hundred-year-old cake recipe. Then I had the hard (but fun) job of deciding which old recipe to make. Should I make a white cake with a rich caramel filling? . . .or a chocolate cake with a whipped cream filling? . 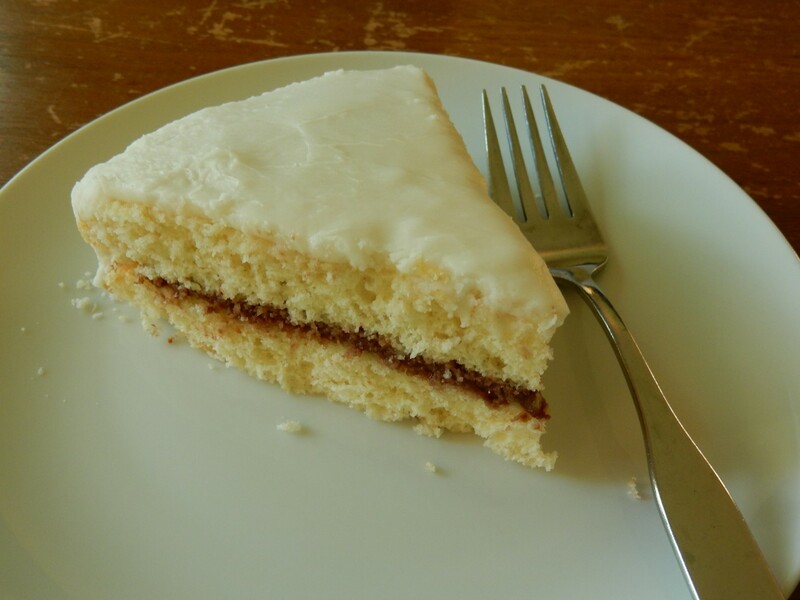 . . or a white cake with a chocolate filling? . . . or a cake with a fruit filling? , . . or . . . ? I finally selected a delightful recipe for Mocha Layer Cake. This really is a recipe for a Sour Cream Cake with a delightful Mocha Filling; and, as I interpreted it, a White Frosting to top everything off. The Sour Cream Cake not as airy as many modern cakes, but it had a wonderful flavor and consistency, and was tender and rich. The hints of coffee and chocolate in the Mocha Filling were nuanced and mild in the assembled cake. Preheat oven to 350° F. Grease two 9-inch round cake pans; line with waxed paper or parchment paper, then grease again and lightly flour. Place all the ingredients in a mixing bowl; beat until thoroughly combined. Pour the batter into the cake pans, dividing evenly between the two pans. Bake for 25 to 30 minutes or until toothpick inserted in center comes out clean. Cool 5 minutes. Remove from pans. Cool 1 hour or until completely cooled. Combine all ingredients in a mixing bowl. ; beat until smooth. Put one cake layer upside down (so that the top surface is flat) on serving plate; spread with the Mocha Filling. Top with the second cake layer, right side up. Ice cake with white frosting. Posted on June 17, 2018 June 16, 2018 by SherylPosted in FoodTagged cake, recipe. This sounds like a wonderful cake — easy, too. I may give it a try with a different filling. I happen to have a bucket of figs I picked yesterday, and there’s no way I can eat them all out of hand (even though I’m more than willing to try). It sounds to me like a fig filling would work well here. What do you think? mmm. . This would be absolutely wonderful with figs. I’m a little jealous that you live in a area where figs grow. Figs help to make up for fireants and humidity! Is confectioners’ sugar what we Brits call icing sugar ? Sounds a good cake! Yes, I’m assuming it’s the same. Confectioner’s sugar is a pulverized sugar that we use in the U.S. to make icing. It looks so good! I’m sure it made someone’s birthday special. This looks like it would be delicious and what a treat to have something different that’s the usual modern cakes. I really like Sour Cream Cake – with or without the filling. I definitely will make it again. There are so many different names for the sugar that is used to make icing – powdered sugar, confectioner’s sugar, icing sugar, etc. For some odd reason, my mother used to call confectioner’s sugar, “10X sugar”. That is because the powdered sugar is sifted 10 times before you use it. Looks amazing! The mocha filling is wonderful. Thanks for sharing! The mocha filling is yummy. Looks so tasty. I love using sour cream in cakes. I think this is the first time that I’ve ever used sour cream in a cake – and I totally agree with you. I love using sour cream in cakes. This cake turned out wonderfully. Oh yum! Hmmm… I think the old folks had a sweet tooth too! I’ll bet this’d be delicious with a cup of coffee. It would be lovely with coffee. Oh boy, this sounds like a good one. I love sour cream. It makes cake richer, I think. And mocha anything is amazing.